Supergirl has a problem. Her powers have been amped up to the point where control is slipping away. So Cousin Kal sends her to Super-Man, the Chinese Superman who in turn refers her to I-Ching, the Chinese sensei of the DC Universe. He knows a thing or two about inner strength. After all, he helped Wonder Woman all those years ago when her powers were stripped away. 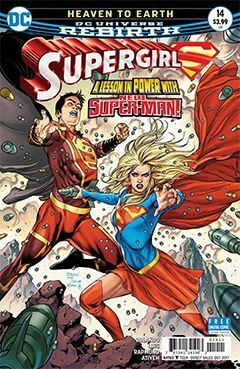 But when a crisis in Mongolia requires Supergirl and Super-Man’s intervention, power may not be the answer. It’s not so much a question of fighting fear with peace, as it is using people’s own weaknesses against them. In the end, a sort of peace is found for all concerned. I do love a single-issue story. Artists Jose Luis and Norm Rapmund are a great team, and I greatly enjoyed their art in this issue. However, it seems to offer greater texture in close-ups. When figures are at a distance, the illustrations seem to flatten out from a lack of texture and dimension. Michael Atiyeh’s colors help in this regard, but not always.